Personal alarms have always been more of a safety device than a fashion accessory, but seeing as the little black number I own has languished in its packaging, maybe it’s a good thing they’re merging. 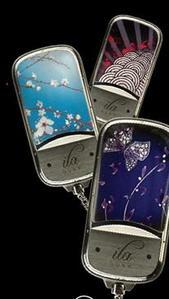 And look how pretty they are- three funky finishes with a little jewel on the clasp. And they’re fully functional too, with a 130 decibel alarm included in this stylish package. The noise is said to mimic that of a high-pitched female scream, which should hopefully have rescuers running to your aid- unless of course you’ve set it off by mistake. why on earth does it cost so much? I really like the look of this personal alarm, its much more fashionable than the black alarm I have got. I want one!